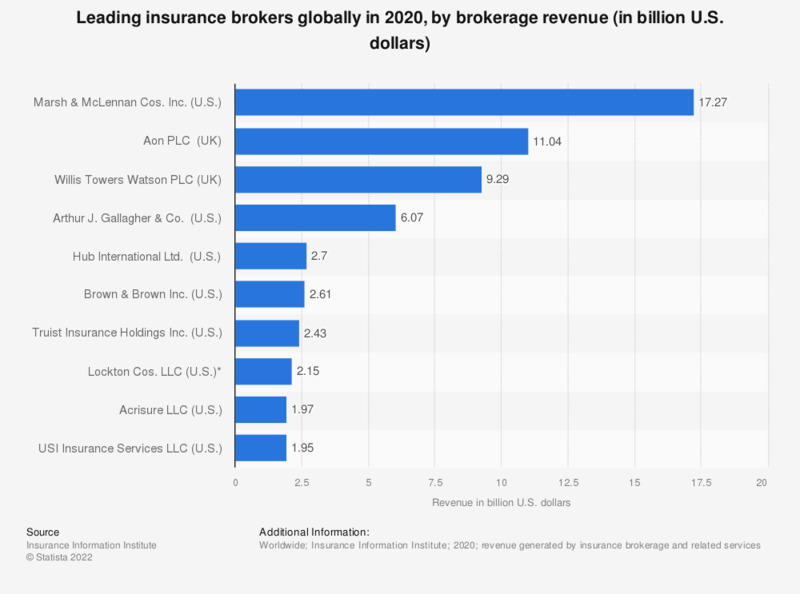 The statistic presents the leading insurance brokers worldwide in 2017, by revenue. With revenue amounting to over 14 billion U.S. dollars in 2017, Marsh & McLennan Cos. Inc. topped the list of leading global insurance brokers globally. An insurance broker (or insurance agent) is an insurance specialist offering consulting services both to individuals and commercial businesses. It is an intermediary between a client being in need of insurance protection and insurance companies. Brokers use their expertise and knowledge of the insurance market and companies to offer their clients the best possible insurance option. When looking for an adequate insurance option, brokers have to take into account such factors as client’s budget, what kinds of insurance are needed and which insurance company bids the most advantageous offer in a particular case. Despite having considerable knowledge about the insurance market, brokers are expected to not favor any particular company, by which they are paid a commission. Apart from providing consultancy and administrative assistance during the insurance research phase, brokers are also of help with issues or questions arising after the insurance contract has been signed. The number of agents, brokers and service employees in the insurance industry in the United States grows from year to year and reached 1.14 million in 2017. * Fiscal year ending April 30.